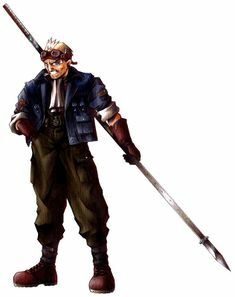 Character information for Cid Highwind, a protagonist of Final Fantasy VII. Included are his background, stats, and limit breaks. Cid Highwind is a former mechanical scientist with an unfulfilled dream of sending a rocket into space. He is tough-sounding and short-tempered, yet he is still a warm-hearted old pilot who hasn’t forgotten his dreams. He believes that someday he will fly to the ends of the universe. With the use of his handmade spear and knowledge of machines, he throws himself into any attack regardless of the danger. There’s no better pilot by the air or sea. In the previous Final Fantasy titles, the Dragoon was a job for characters with great physical attributes, but low dexterity and limited or no magic abilities at all. Dragoons are further characterized by their focus on spears and jumping techniques. Highwind 4 18 random attacks Use the submarine to reach the sunken Gelnika, an airplane wreck found in one of the bays. The manual can be found in the cargo hold.